Our floor standing tower speakers are the perfect accent to any home audio system. Elegant design and big sound, these speakers have it all! 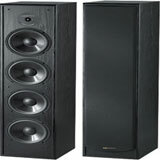 We carry a full line of tower speakers from BIC America and Cerwin-Vega.